One of the things we love about classes at Richmond is the opportunity to venture off campus and into the local community, whether to learn about real-world issues or make a positive impact. Take Jennifer Sevin’s ecology class and Heather Russell’s math class — both groups have taken what they’ve learned in class so far to help others in Richmond. 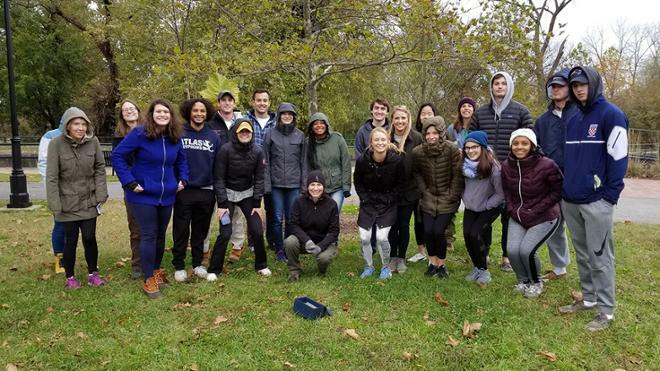 The ecology class is studying habitat restoration and invasive species, so they teamed up with the James River Association to plant native trees on nearby Chapel Island. Meanwhile, Russell and 20 students participated in a Girls in Math Day, designed to get local middle school girls excited about pursuing mathematics. They hosted an activity about the mathematical strategy and logic behind the game Tic-Tac-Toe to demonstrate that math doesn’t have to look like algebra or geometry. We’re proud of our faculty and students who are passionate about giving back — not just to our Spider Family, but the local community as well.